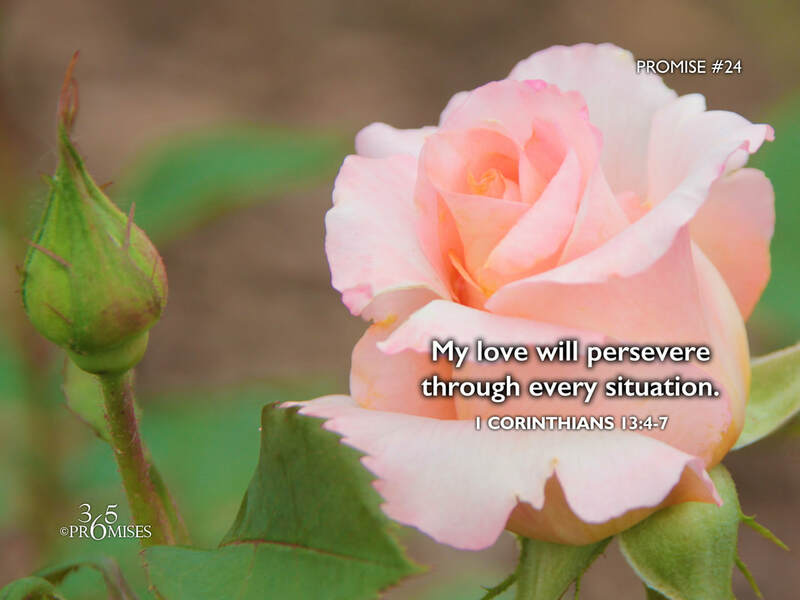 My love will persevere through every situation. 4 Love is patient and is kind; love doesn’t envy. Love doesn’t brag, is not proud, 5 doesn’t behave itself inappropriately, doesn’t seek its own way, is not provoked, takes no account of evil; 6 doesn’t rejoice in unrighteousness, but rejoices with the truth; 7 bears all things, believes all things, hopes all things, endures all things. The Greek word for love used in this passage of Scripture is the word agape which speaks of the unconditional love of God. Today's promise speaks of the tenacious heart of our Father that will simply not give up on us no matter what we go through. God's love is relentless and consistent. His love for us does not change like shifting shadows, but will persevere through every circumstance. His love will always protect us, His love will always trust, His love will always believe the best about every situation and His love will always stay true. This is the love that God has for us.